The Nov. 6, 2018 general election is a few days away, but you don't have to wait to cast your vote. Most counties offer options for early voting at their local county registrar's office or other designated locations, but a more popular option: voting by mail. Elected officials across the state, including those in Los Angeles County and Orange County, have been sending out vote-by-mail ballots. But you can still sign up for a mail ballot — just do so by Tuesday, Oct. 30. If you live in L.A. County, visit the county website to request a vote-by-mail ballot. If you live in Orange County, check the instructions here. Another option, regardless of where you live in California, is to fill out this form provided by the Secretary of State and turn it into your county elections office by Oct. 30. To find out how to contact your county's elections office, check out this contact list. Q: I live in L.A. County, and I've heard my ballot is going to look different. What should I expect? L.A. County's vote-by-mail underwent a redesign with this election, so they won't look familiar, but they should be easier to understand. Here's how they've changed: In the past, voters had to find their chosen candidate's name in a guide and then turn to their Scantron-like ballot to fill in the oval with the candidate's corresponding number. One important thing to note is your ballot could have multiple pages and races on the front and back. At the top right corner of the ballot, you can see which page out of the total you're looking at. Make sure you've completed every page before you send it back. The full vote-by-mail packet will have several items: your official ballot, a secrecy sleeve (with instructions detailing how to vote on the back), a return envelope and an "I Voted" sticker. You can read more about the new ballots here. If you live in Orange County, don't worry — your vote-by-mail ballot won't have any surprises, but you can expect some changes in polling places. So look for details from your elections office. Q: Alright, I've filled out my vote-by-mail ballot. How do I turn it in? And how much postage is required? You can mail it in and just make sure it's postmarked by Nov. 6. You can also turn it in at your polling place on election day. If you do mail in your ballot, the amount of postage you need depends on the county you live in. 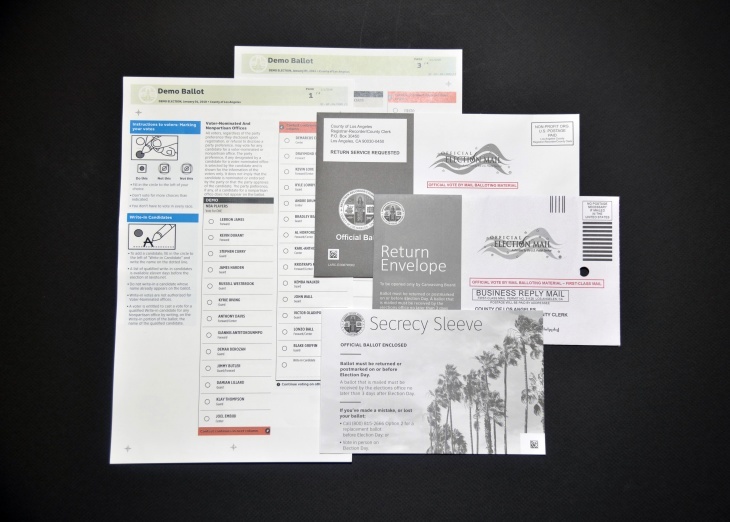 In L.A. County, no postage is necessary for the November election — you're fully covered. In Orange County, the postal rate is 50 cents, so a single first-class stamp will cover it. Starting in 2019, your postage will be covered, too, thanks to a new state law Gov. Jerry Brown approved in July. Q: I requested a vote-by-mail ballot, but I'd rather vote in person at the polls. Is that OK? Yes — but bring your vote-by-mail ballot with you and turn it in at your polling location to avoid any issues. Otherwise, you'll have to cast a provisional ballot so they can verify you didn't also vote by mail. If you forget to bring along your vote-by-mail ballot, that's okay. Your provisional vote will still be counted after your information is verified for eligibility. Q: How can I make sure my ballot was received and counted? If you live in L.A. County, check here. If you live in Orange County check here. If you live elsewhere in California, check with your county's election office here for your vote-by-mail ballot status. Q: I keep requesting a vote-by-mail ballot every year. Is there a way I can opt in permanently? Yes, but you have to re-register first. Unfortunately, the online voter registration deadline for this election was Oct. 22. The good news is you can still get a one-time vote-by-mail ballot even if you miss that date. But request it by Tuesday, Oct. 30.